A bar/lounge is on site where guests can unwind with a drink. A complimentary breakfast is offered. A computer station is located on site and wired and wireless Internet access is complimentary. This hotel offers access to a 24-hour business center. Event facilities measuring 15000 square feet (1394 square meters) include a conference center. This business-friendly hotel also offers a fitness center, multilingual staff, and concierge services. Limited complimentary onsite parking is available on a first-come, first-served basis. UMass Lowell Inn and Conference Center is a smoke-free property. Located in the heart of Lowell, this hotel is within a 15-minute walk of Lowell Memorial Auditorium and Tsongas Arena. University of Massachusetts Lowell is 1.4 mi (2.3 km) away. Lowell Station is 17 minutes by foot. 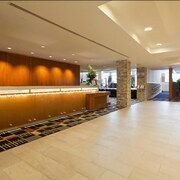 Along with a fitness center, this smoke-free hotel has a bar/lounge and a 24-hour business center. Free continental breakfast, free WiFi in public areas, and free self parking are also provided. 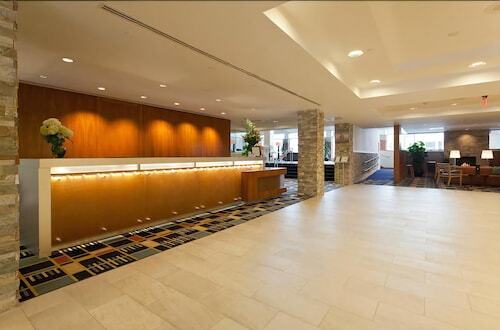 Other amenities include a conference center, conference space, and concierge services. All 31 rooms offer free WiFi and free wired Internet, plus coffee makers and cable TV. Other amenities available to guests include hair dryers, phones, and desks. UMass Lowell Inn and Conference Center offers 31 air-conditioned accommodations with coffee/tea makers and hair dryers. Televisions come with cable channels. Guests can surf the web using the complimentary wired and wireless Internet access. Business-friendly amenities include desks and phones. Additionally, rooms include complimentary toiletries and blackout drapes/curtains. Housekeeping is offered daily and irons/ironing boards can be requested. Rollaway/extra beds are available for USD 10.0 per stay.